While social media gets credit for shifting the balance of power from marketers to consumers, the reality is that consumers have relied upon their trusted sources, namely family, friends and neighbors long before Facebook and the Internet ever existed. Social media just provides platforms that extend the reach of individual consumers to influence others, including strangers that they’ve never met in real life. 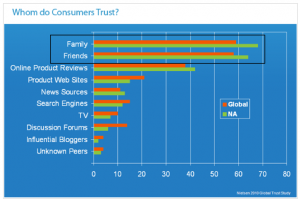 In part, social media can do this because consumer trust is scarce. In today’s rush-to-profitability world, companies forget that they must engage with their prospects and customers. Old-fashioned word of mouth still rules! One of the most notable examples is hairdressers. Ask a woman how she found her hairdresser and the odds are that a friend or family member made the recommendation. My husband kids that there’s always someone waiting at his barber for a $15.00 haircut while the barbershop down the block, which charges $13.50, is empty. Here in Manhattan, a crowd or a line is an accepted sign of approval. Like a bestseller list for book shoppers, the line at the barbershop is the wisdom of crowds on a local level. BTW, my husband has never tried the less expensive barber. Enter social media and consumers’ options for gathering input on products expands significantly. The public is no longer limited to their direct contacts, family and friends. Now they can reach friends of friends of friends effortlessly via a variety of social media platforms. And if the information they seek is beyond direct reach, unusual or esoteric, they can at least get other consumers’ input on the product or issue. Interestingly, family and friends still dominate in terms of trust. 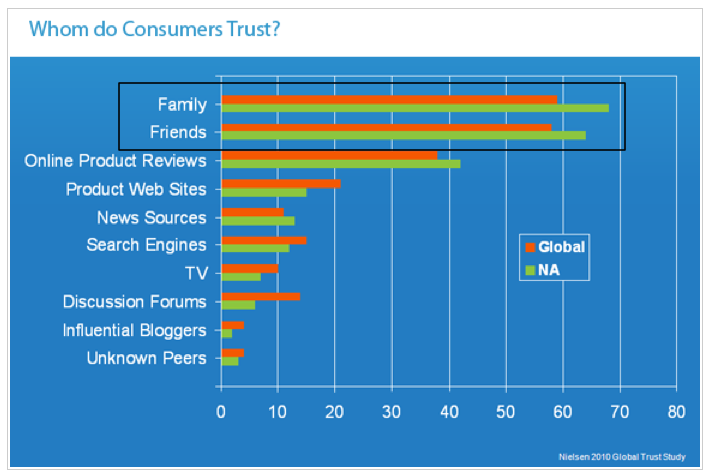 Data from The Nielsen Company’s 2010 Global Trust Study shows that consumers trust family and friends significantly more than other sources. These two categories have over a 50% trust level. As a second choice, consumers will use the collective feedback of strangers or the wisdom of crowds in the form of online customer reviews with about 40% trust. While all the other categories combined have 20% or less. 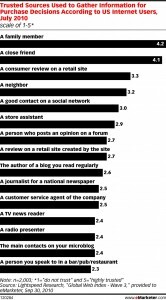 Other research conducted by Lightspeed via eMarketer confirms this hierarchy of trust among consumers. The research again shows family and friends at the top of the list and, again, the collective wisdom of other consumers follows in terms of most trusted. 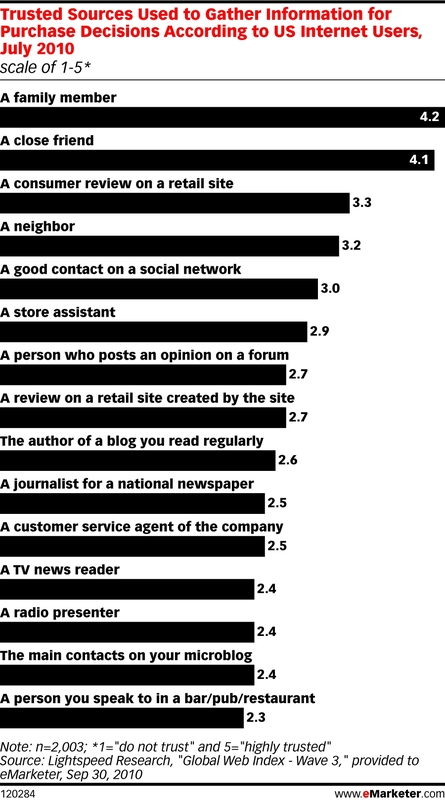 Interestingly, neighbors, who may or may not be friends lag a cross section of consumers. At their core, social media platforms provide better calibrated ways to assess a person’s trustworthiness and to collect and integrate input from a diverse group of users. From a marketing perspective, the trust and influence of social media connections is important because some of these factors occur before a company even realizes that a consumer is in the market for a specific product. This happens because recommendations occur spontaneously and frictionlessly during social media exchanges. 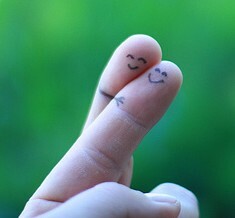 How do you think that marketers should build trust with their customers and the public by tapping into social media? Do you have any examples to share? Tags Consumer trust, Trust. Bookmark the permalink.